Grave near Victoria on the harbour, 1859, by William Tyrwhitt-Drake. Source: British Museum. Click for their record and verso. 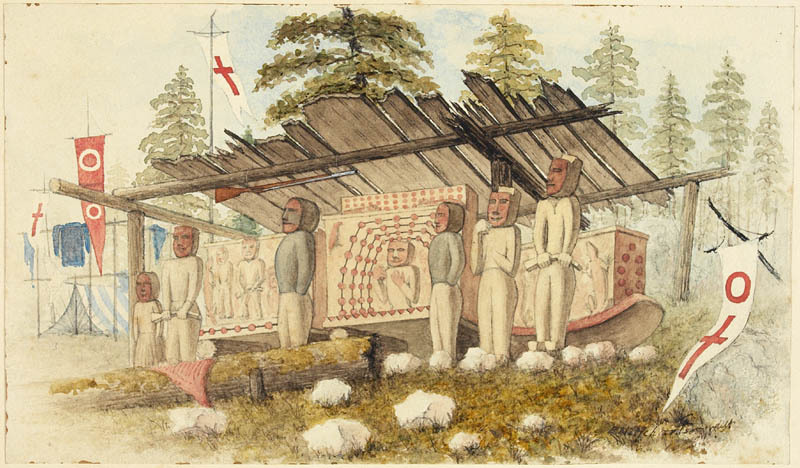 So, not long ago we had an excellent discussion here centered around Edward Richardson’s 1864 painting of a Coast Salish grave house or mausoleum. I’ve recently come across another set of images of these places which are so important to First Nations. These images were painted by well-known early Victoria resident (and former mayor and Supreme Court of BC Justice) Montague Tyrwhitt-Drake. They’re pretty interesting paintings from the early colonial period on southern Vancouver Island which I don’t recall seeing before. This is another eccentric specimen of Indian taste for sculpture, it is equal to the finest specimens of _________ — see the elegant attitude of that man scratching his ?cheek bone, but a _____ ________ _______ would have mastered __________ a flight of ___________ imagination. The other is holding two dogs [sic] of a breed which I am afraid is lost to the present generation. This ______ are carved in wood and _____ ________ near a large grave of the family vault above ground ___________ . It”s true, both sculptures are lively and naturalistic. In both cases, and the one below, there is apparently a rendering of face paint. I’m sure those readers more knowledgeable than I will see a lot of interesting detail in these pictures. Note the open prairie environment – anthropogenic Garry Oak meadow, no doubt. A Salish Grave, 1864. Watercolour by Edward M. Richardson. No specific locale given. Source: CollectionsCanada.gc.ca Click to enlarge slightly. “Grave House” is one of those archaeological terms which render slightly creepy a feature that is more or less an everyday experience: the mausoleum, a house for the dead, filled with coffins. Subject depicts grave boxes in a grave house with guardian figures. The grave house is covered with a roof of wooden planks but has no walls. At the front of the house stands six guardian figures. There are flags to the left and right of the house. On the left hand side of the house a tent is set up and clothes are hanging. A shotgun hangs from the front beam of the house. Item was up for auction in the September 28, 1970 Christie’s sale in Calgary. Lot 31.